My son and I are acting like old grandma lately, enjoying tea and scones. LOL! I like scones but never this much like now. I guess I must been influenced by my scones-loving son. Well, what make an eight-year-old boy loving his scones so much? It started when he had his first scones with jam and cream when we were on our eleven-hours train ride to and fro Sydney. You know... When the train rides were extremely long and boring, the warm and simple commercially-made scones can strangely taste so extra yummy! LOL! Then, our scones-loving adventure continues as we seek to try many famous and interesting scones. 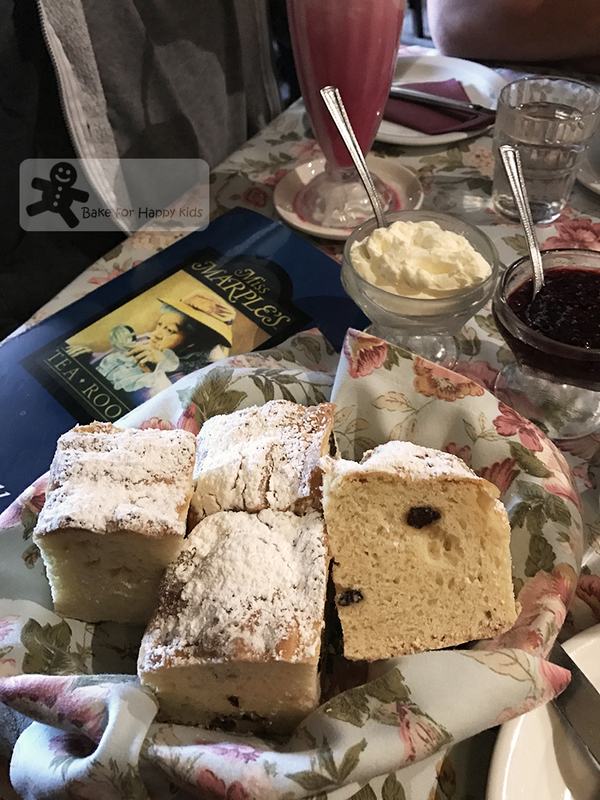 One of the very popular scones that we had tried is the square and extremely fluffy scones from Miss Marple's Tearoom which is situated along Mount Dandenong Tourist Rd at Sassafras, Victoria. These scones and the country setting of the tearoom are very lovely but... honestly speaking, we all think that the over-fluffy square scones are NOT really scones-enough for us!!! Alright. You might say that how does a non-English non-Aussie me would know anything about scones? My husband showed the photo of the Miss Marple's scones to his Aussie colleagues and they all agreed that these overly fluffy square bakes are not scones! Well, don't you think that these tall and fluffy square so-called scones do look and taste more like Australian spongy damper that are cut into squares? Maybe I shouldn't judge and compare if I have not taste any ultimate fluffy scones before. Despite that I have baked and tasted many really good scones recipes at here, here, here, here and here, they are never as fluffy as the scones at Miss Marple's Tearoom. I ask myself... Is there a scone that is ultimate fluffy? The Ultimate Fluffy Scones that I have baked eventually!!! 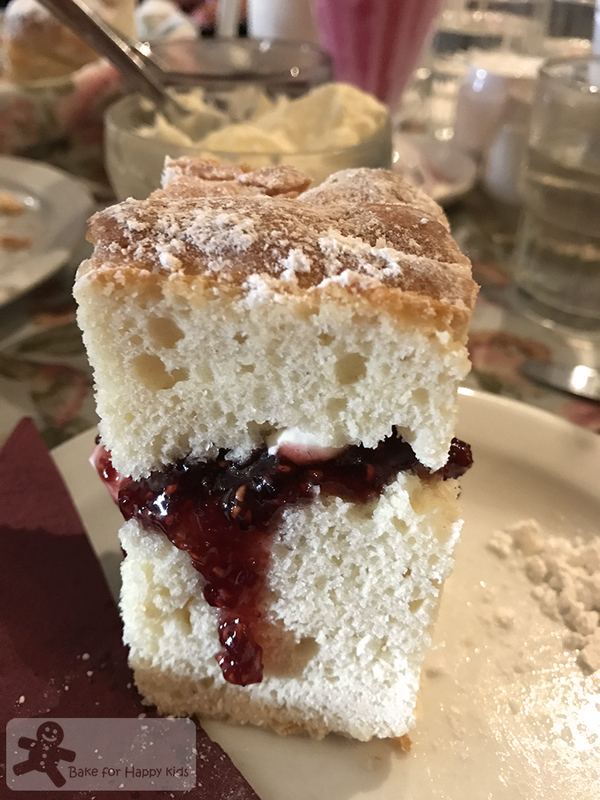 Have you tried the extremely fluffy scones at the very popular Miss Marple's Tearoom? Gosh! It was so difficult to get into the tearoom! We had to wait at least 2 hours just to get a seat in the tearoom and eat these scones. And I wonder if this is the reason why we are a little disappointed with the extremely fluffy damper-like scones? Are we expecting too much after queuing for two long hours just to get a taste of these extremely popular scones? The scones that we had at Miss Marple's Tearoom. A little disappointed even though the scones were tall and fluffy. Ultimate fluffy? We are after scones that are feathery light and fluffy, ideally with a nice biscuit-y buttery top. To contrast, Miss Marple's scones are tall and spongy but they are rather heavy and do not have a biscuit-y buttery top. Looking at the above ultimate recipes very closely, I can see their similarities and also their differences. Essentially, all three recipes uses self raising flour instead of all purpose flour and baking powder. Then, I noticed that both recipes from ABC Delicious and Taste.com are exactly the same! So first, I tried baking with the all-cream scones recipes from ABC Delicious and Taste.com and they were in fact dry with no fluffy texture. Ultimate? No way!!! Obviously then, it's clear that we should stick to the butter and buttermilk recipe from BBC. Looking at the recipe closely again, I see that it is quite like the Margaret Fulton's most perfect extra fluffy dainty scones at here but it contains sugar, 20g more butter, 1/4 cup less buttermilk and 1/4 cup milk. 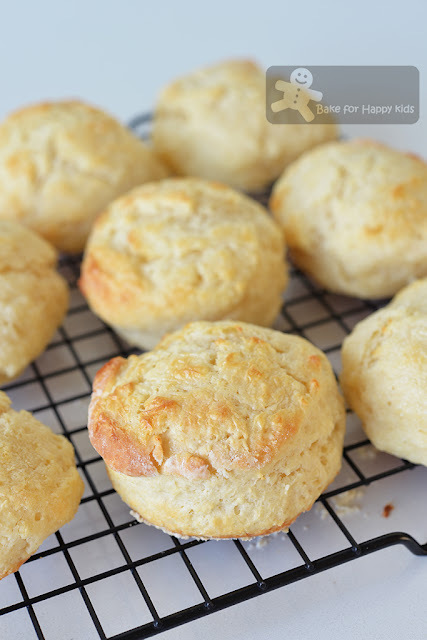 I guess the missing buttermilk in this recipe is substitute with the same amount of milk and do you think that this combination will make the scones more fluffier? Or even ultimately fluffier? These are the buttermilk scones made from the adapted BBC ultimate scone recipe. After examining the scones thoroughly, I see that these scones don't puff up as much as the Margaret Fulton's most perfect extra fluffy dainty scones at here but interestingly, the addition of extra butter and the use of 1/4 cup milk (not the thick and curdly buttermilk) do create an ultimate feathery light flaky texture! In fact, they are so much lighter than all scones that I have baked or tried. However, the moist and extra feathery light texture is also making the scones less biscuity on their tops as they won't develop a deep golden colour even the scones are thoroughly baked. See... These scones are so fluffy with feathery light flaky crumbs! Ultimate yummy with jam and cream! Judging from all that I have tasted, I have say that these scones can be truly descried as ultimate fluffy. Likewise, my scones-loving son said the same too! On the other hand, my son said that he likes our favourite cream scone more because the cream scones taste more milky, moister with denser creamy crumbs. And most importantly, the cream scones have a more biscuity top! Light and fluffy vs creamy scones? Tender soft crumbs vs crusty biscuit-y top? Hmmm... I guess this is all personal preference. 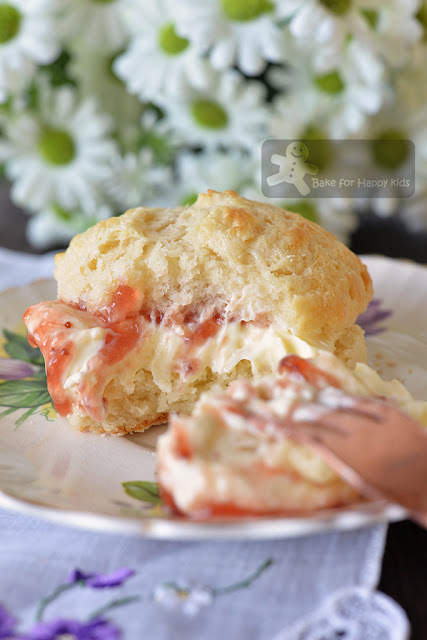 Nevertheless, we both have unanimously agreed that these ultimately light and fluffy scones are delicious and wouldn't mind baking and enjoying these scones again and again. Want more scones? I promise that I have MANY different interesting and delicious scones recipes to share in the near future and so please stay tune!!! To get the latest updates of my bakes, you can follow me at either my Facebook at here or here or my Instagram @zoebakeforhappykids. Here's a quick video showing I baked these heavenly feathery light scones. cream or buttermilk for brushing, preferably cream because the tops don't turn deep golden very well. *Please DO NOT replace self-raising flour with plain flour (or all purpose flour) plus baking powder. Although the chemistry of both self-raising flour and baking powder added are the same, the raising strength of self-raising flour has shown to be the best for making scones!!! Besides, adding excessive baking powder into plain flour won't work too because too much baking powder will cause the scones to have a yucky metallic aftertaste. Preheat oven to 220°C /430°F or 200°C (fan forced). Line baking tray with baking paper and dust the baking paper with flour. Sift flour and salt into a large mixing bowl. Using your fingertips, rub butter into flour mixture until mixture resembles breadcrumbs and the butter is evenly incorporated. Stir in sugar and make a well in the centre. Combine buttermilk and milk. Add the milk mixture into the flour mixture and use one or two blunt round-edged knifes to mix with a cutting action until the soft sticky dough is form. Add a little buttermilk (1-2 tsp or less) if required to moisten any dry crumbs and incorporate all dry ingredients into the dough. DO NOT over-mix or over-work dough as it toughen the texture. Transfer dough onto a lightly floured work surface. Use your hand to flatten the dough into a flat round with about 2 cm (3/4 inches) thickness. Using a lightly floured 6 cm round cookie cutter, cut the dough into 8 rounds and place them on the prepared tray, about 2 cm (3/4 inches) apart. 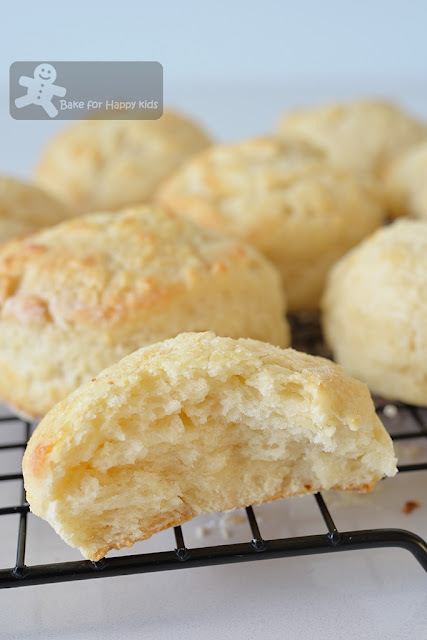 Use a pastry brush to lightly brush the top of each scone with cream or buttermilk. Bake in the middle of the preheated oven for 12 mins, or until the scones are golden and cooked through. Serve warm or at room temperature, split and topped with jam and cream. 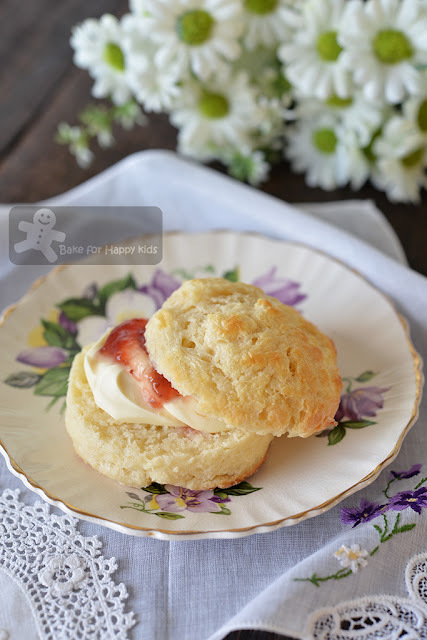 These heavenly light scones are the best on the day that they are made. Looks delicious! Placing them close together will help them to rise. Have you tried the ones with lemonade? Hi, Yes that I did tried baking the lemonade scones at http://www.bakeforhappykids.com/2011/03/lemonade-scones.html and also place them close together. They are nice but not as fluffy as these ultimate scones. Cheers! Oh great! Will have to try these then! :) Do they freeze well? Hi Cheryl, Scones are always the best to enjoy on the day of bake. You can freeze them but they won't be as good. Hi :) this scone look very nice. I wish to try out also but what is buttermilk? Hi Cyndi, Definition of buttermilk is at https://en.wikipedia.org/wiki/Buttermilk. Cheers! I agree. Not as fluffy. Do like these ultimate scones though.